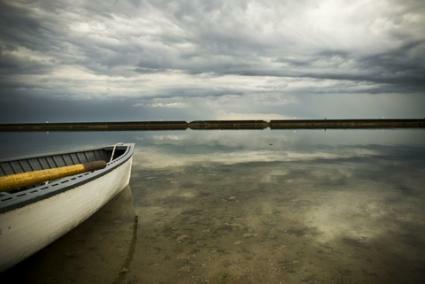 A rowboat rests on Sunnyside Beach where an amusement park once stood. For 33 years, the Sunnyside Amusement Park was the summer home of many Toronto, Canada, residents. This defunct theme park, which closed its gates in 1955, offered guests a variety of attractions from swimming and picnicking to dining in a tea garden and riding various roller coasters. Located along the Lake Ontario waterfront in western Toronto, Canada, Sunnyside Amusement Park opened its gates in 1922. However, for roughly 70 years prior to that, the area was known solely as Sunnyside Beach, where swimmers and bathers from all over came to enjoy the cool waters of this Great Lake. The beach and future theme park were named after a nearby farm, Sunnyside, which was owned John George Howard. Around the turn of the 20th century, the Toronto Harbour Commission came up with a plan to improve about four miles of the lake's shoreline around Sunnyside Beach. It included creating a boardwalk that soon became the foundation for Sunnyside's theme park, which eventually was situated atop the dredged sand and soil of this beach. While there was no admission fee to enter the theme park, the various rides and concessions had set prices. Even the bathing pavilion charged for its services. Sunnyside's merry-go-round was moved to Disneyland in 1955 and renamed King Arthur's Carousel. As with most businesses and entertainment entities in North America, World War II brought a decline in the number of park guests (actual numbers are unavailable). This area of Toronto, Canada, was booming with new homes and residents, which caused massive traffic jams on the roads leading to and from the theme park. To alleviate this congestion, Toronto's planning board designed a 10-mile freeway project that would cross right through Sunnyside, extinguishing any plans for the park's future. . In 1955, the Toronto Harbour Commission ordered the demolition of Sunnyside theme park, much to the public's dismay. Most of attractions and rides were demolished except for a few. The merry-go-round was purchased by Walt Disney and moved to his new Southern California theme park, Disneyland. It was renamed to King Arthur's Carousel. The Derby Racer was moved to the Canadian National Exhibition in Toronto, Canada. Sunnyside pool: This swimming area is owned and operated by the city of Toronto and renamed Gus Ryder Pool. Bathing Pavilion: It was renovated in 1980 and now houses a cafe and tea garden. Palais Royale: This structure was renovated and is rented out for special events. Parkland: The area of land between the old Sunnyside Pavilion and the Palais Royale was renamed Budapest Park. Land west of the Bathing Pavilion was renamed Sir Casimir Gzowski Park and is home to a children's playground and picnic site. Even though Sunnyside's theme park is gone, there are still a few groups online who have collected various images and historical facts about it. Check out the group's Facebook page for more information or visit the Coaster Enthusiasts of Canada's tribute, Closed Canadian Parks.